Many casual rock fans get stuck on this poser: name the band who were greatly influenced by both Bob Dylan and The Beatles, and in turn had major influence on Bob Dylan and The Beatles. The answer is The Byrds. Similarly, another ’60s-born Southern California-based outfit led several lives, one that is extremely more commercially popular than the others, but those lesser-known years irrevocably changed the language of pop music. Appearing: May 21st and 22nd at Chicago Theatre (175 N. State) in Chicago. They are The Beach Boys. Consequently, an army of self-styled “serious” listeners ignore The Beach Boys’ early hits — as they do The Beatles’ — believing Pet Sounds and its besieged, ultimately released (in 2004) successor Smile are the band’s true legacy. Because Brian Wilson was central to those albums, those cognoscenti then err by clipping their Beach Boys’ collections when Wilson’s drug use and mental instability drove him into seclusion, and they are comically unaware of albums like Sunflower, when the rest of the band blossomed. “I would say the reason we’re here is because the early stuff is taken so incredibly seriously,” says Bruce Johnston. “I’d say it’s the reverse. I think people get a little itchy and antsy when [on tour, Mike Love and I] try to go deep. The problem music, I think, is the deeper stuff. The whole world knows the early stuff. And so you shall have it. 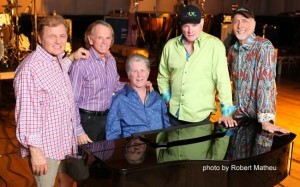 For their 50th anniversary — allegedly the first American rock group to reach the milestone — Johnston, Love, Brian Wilson, and Al Jardine are touring one last time, so people can hear the full spectacle from “Surfin'” to a new album, That’s Why God Made The Radio, due June 5th. But surely Love and Johnston don’t need Wilson along to dabble in Pet Sounds, and he admits that the pair cover more than half of the album when hitting the likes of Ravinia each summer. In half of a century, The Beach Boys have certainly been entitled to a few squabbles, and those mostly limit themselves to lawsuits over royalties or use of the band name. Musically, fractures appeared in the agonizing sessions for Smile, when Wilson became increasingly withdrawn, Love especially didn’t like its fragmented nature or Van Dyke Parks’ cryptic lyrics, and Capitol Records wanted to know where its money went. “I always thought Smile should have been Brian’s solo album with us visiting vocally,” Johnston says, “and I don’t think he would have gone through any of the pain making that album. The label wouldn’t be wondering, ‘Where are the hits, Brian? 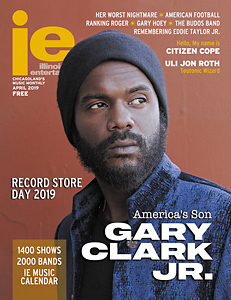 Where are the hits?’ The label was really funky in those days.” Though he’s not a founding member — he joined the touring band after Glen Campbell split in 1965; he wasn’t considered a full-timer until a couple of years later — Johnston occupies what seems like an arbiter’s position in the band. He was one of Pet Sounds‘ biggest champions, yet tours in full-voice behind the early hits. And those topsy-turvy years beginning 1967’s Smiley Smile? Reliably, he’s partial to the new album, as well. That’s Why God Made The Radio‘s title track has been issued as the first single, and its unabashedly retro feel is charismatic. The band’s rich harmonies cascade over a bass pattern that’s surprisingly high in the mix, with everything swaying in 12/8 time. Despite the arrangement’s density, it never feels cluttered and — like most Beach Boys single edits — ends too soon. If the material was written in 1998, that means it came to life while Wilson was living in St. Charles, not far from the Thomas whose résumé includes work with McCartney and Elton John. The pair were working on Wilson’s solo album, Imagination, and guests at the house included the former Beatle, John Lennon’s son Sean, and Joe Walsh. After an alleged falling-out, Wilson moved back to California. This part, he’s not so willing to talk about. Johnston, coincidentally, also has ties to the area, having been born in Peoria and kept a home in Beverly. His father, a big-wig at Walgreens, adopted him shortly before joining forces with Justin Dart, a former son-in-law of the Walgreens empire who revolutionized the drugstore business and became a magnate. The Johnstons moved to Bel-Air, young Bruce cottoned to surfing, and then fell in with some incredibly important artists.